It seems to be the season that Miuccia Prada has decided to retread familiar ground, which could have something to do with a conversational retrospective of her work pitted against Elsa Schiaparelli's at the Met Museum in New York. Or it could be that Miuccia felt it was time to revisit her own 'ugly-chic' innovations, when so many other designers have appropriated it. 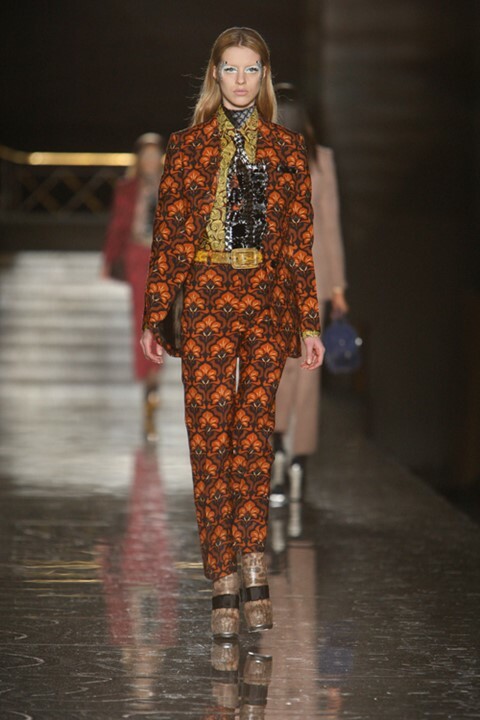 What was new was the fact that there were more trousers than skirts and dresses – the matching trouser suit came out in shantung silk shades of berry, mustard and forest green and then did a crescendo into checks, geometrics and lurid prints, tinged with a cornucopia of retro references that range from Austin Powers to The Brady Bunch to the London emporium Granny Takes a Trip. She played around with the idea of the 'naff' shirt and the 'party tie' by making the ruffles down the front extra stiff and the prints on the ties extra loud. The clumpy platform shoes decorated like a 70s airport lounge recalled late 90s Miu Miu shoes and both those 90s relics and these present day shoes still raise questions of conventional taste. Like the Prada show in Milan, the colours and prints were pure Miuccia – garish and rich without you knowing why you find them appealing. Mirror embroidery on A-line mini dresses that closed the show also were an engorged version of what Miuccia has done in the past. Still, this was the sort of rehash that suddenly feels fresh and current again. When you’re an innovator that’s ahead of the curve as Miuccia is, looking back on your own ideas will always be a trip. The show soundtrack featuring Björk’s 'Violently Happy' summed it up nicely.